Popular Irony: G'day Slekim Du Nogo, Cut me head off mate? Hello Friend, it me, you old pal Slekim Du Nogo. After many day, Slekim boat reach new land. Slekim happy to be on adventure. This land look nothing like land in scenic central mountain of Papua New Guinea, where Slekim from. Travel make Slekim think, think life, think love, think big, think world diversity. It make Slekim happy to see that person all different but at same time, person all same... You know what Slekim mean? OOH! There person on beach! Slekim cut person fuggin head off. Slekim smart hunter. Slekim observe prey and study prey behavior. When Slekim know how prey think, that when Slekim cut off person head. Sun Tzu say "If you know the enemy and know yourself you need not fear the results of a hundred battles." But Sun Tzu say many thing. 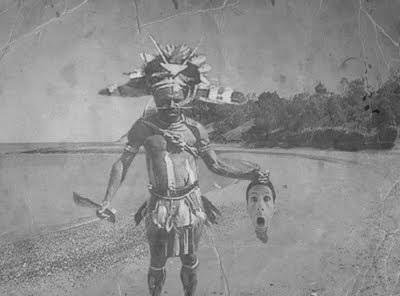 Slekim first trophy on "Slekim International Head Hunt" is Australian man person. Australian land where man person wear cork-hat and all animal make poison death. This Australian man person no have cork-hat. Oh well, Slekim gotta cut head off something. Slekim pull out Slekim bone knife and Slekim walk right up to Australian man person. He say "G'day" and Slekim say "AAAAAAAAAAAAAAAAAAAAAAHHHHHH!!" Slekim quickly SAW STAB CHOP SAW TUG SAW TUG SAW POP and person head come right off. That fun. Australian man person no expect that today. Slekim can't stop laughing at funny Australian man person surprise face, look he still have it. HA HA! Well, it look like this all Australian land have to offer so Slekim leave. Slekim got new Australian person head and Slekim damn proud. Slekim get back into Slekim tree boat and continue "Slekim International Head Hunt". Where Slekim gonna end up next? Slekim have no fuggin clue. Maybe you house. Maybe you and Slekim spend night together? Maybe you let Slekim..... cut you head off?